CSU-Global’s Undergraduate Certificate in Marketing* prepares you for many areas within marketing including creative services, strategic planning, advertising, research, promotion and public relations. 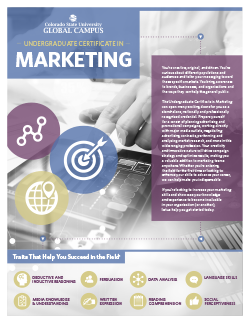 This transcribable, nationally, and professionally recognized certificate gives you the skills, knowledge, and real-world experience necessary to stand out and move up in your marketing career. By studying and applying current marketing theory, including defining target markets, understanding buyer behavior, and evaluating market segments, you’ll be able to build and implement highly effective marketing strategies. Apply the principles of branding, customer lifetime value, and customer retention to traditional and digital marketing. Understand how marketing practices support an organization’s domestic and global marketing strategies plus communications mix. Describe how a company uses various traditional and non-traditional marketing tools to reach its target market. Analyze how marketing efforts are evaluated using traditional market research methods as well as search engine optimization, social media metrics, lead generation, and other methods. Assess the challenges associated with privacy, security, and ethics associated with marketing.